Exploring the World of Music by Dorothea E. Hast, James R. Cowdery, and Stan Scott gives back to music the instrumental, ethnic, historical, geographical, and social contexts that are too often lost in sound recordings alone. The world is full of many kinds of music, each embodying different cultural needs. Starting from the proposition that all musics are created equal, this twelve-part television series and college telecourse explores how people define, create, value, and use music in cultures around the world.Through precious archival footage and contemporary performances, the series explores the basic elements of rhythm, melody, timbre, texture, harmony, and form. Larger themes are also examined, including music and the environment, how we transmit music as cultural memory, how technology changes music, and how music changes us.The history of music and the great landmarks of Western music are explored while being woven into a broad tapestry that reaches out around the globe even more than it reaches back in time. 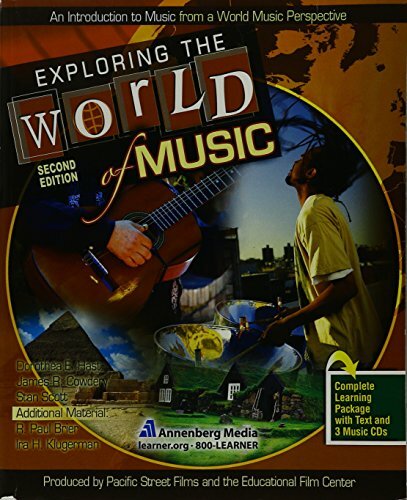 Using this multicultural approach, each program focuses on one of the elements of music or one major theme, exploring it from various cultural and historical perspectives.This text can be used in:in music appreciation, introduction to music, or world music classesas a complete college- level telecourse for distance learning studentsas a library and media center reference for teachers and students of history, anthropology, sociology, ethnic studies, and ethnomusicology.Instructor's Manual Included.